Consider vegetable protein powder. It is expensive, but light. Your body will be trying to build up muscle during the trek, as well as repair muscle damage daily, and usual protein sources like meat, fish, eggs and beans are either impractical or heavy. I mix protein powder with my morning muesli. I prefer vegetable rather than milk whey protein because it mixes with water more easily and doesn’t have a greasy texture and taste. Plus it comes from a more environmentally friendly and ethical source. You can buy it at health food stores and body building shops. And don’t forget the protein value of nuts as well as their slow-burn energy value. They are expensive but filling and convenient to eat. Vegetables are another thing that are heavy and largely impractical to carry. Dried peas fill some of the gap. You don’t have to boil them – just bring to the boil and let stand. Unfortunately dried mixed vegetables no longer seem to be available on supermarket shelves but you may be able to improvise from an Indian food store. If you have a taste for dried seaweed then this is another form of vegetable, and is very light weight. Asian stores or Asian food sections of the larger supermarkets are the place to find it. Dried potato is a great source of carbohydrate bulk. It is light, cheap, and easily prepared. It can even be mixed and eaten cold. The Maggi version is more tasty than the plain packets found in the larger supermarkets, though more expensive. And you can now buy dehydrated kumara (sweet potato) in supermarkets. Delicious! But has a very high sugar content and is not as cheap as potato. Couscous is the other all-purpose carbohydrate, though heavier. Wraps and tortillas are becoming popular as a bread substitute. They last quite well, are compact, and can slide down the back of a pack without getting crushed. I like the mountain bread version. Thinner and drier and weighs less, but seems to be only available in the South Island for some reason. You can always make your own dehydrated meals, but it saves a lot of time to just buy them. They are expensive, so best to stock up when there are sales. Backcountry Cuisine meals are sold in all outdoor supply stores, as well as in supermarkets in centres for outdoor activities such as Te Anau and Wanaka. I prefer the 2-serving size as the singles just aren’t big enough after an eight hour walk. But sometimes I bulk the singles (or even the doubles) out with dried peas, couscous or potato. A new, slightly cheaper, manufacturer is Absolute Wilderness, who vacuum-pack their meals, saving a lot of bulk. There are not many retailers selling their products yet, but there are stockists in Invercargill, Queenstown and Wanaka on your route (see the Absolute Wilderness website for details). You can mail order from them too. Note that nearly all their meals are only 90-100g single serves. And if you are coming from the US (or Europe perhaps) you may find that the range of dehydrated meals and other dehydrated products is more limited in New Zealand, so you could always bring your own. NZ has strict rules on bringing food into the country for bio-security reasons, but if it is commercially produced and factory sealed you will be OK. Dried fruit, nuts, muesli, muesli bars, etc all seem to be OK. Just declare on the entry form that you have food and explain what it is to the customs officer and you will be fine. They appreciate your being upfront and honest about food. The big no-nos are fresh meat, fruit and vegetables, as well as eggs and honey. And if you have been hiking recently remember to declare this also on the form and clean your footwear, tent pegs and hiking poles before you get on a plane for NZ – these are commonly inspected for dirt and seeds. Another food type that’s hard to get when hiking is fat. Some people take a bottle of olive oil, but a (plastic) jar of peanut butter is maybe as good and less messy. No need to spread it on anything, just eat from the jar. Though given that the quality brands of peanut butter are simply made from ground nuts, you could always just take peanuts and avoid the bulk of a jar and the risk of the oil running out and ruining things. Not quite as good as comfort food on a rainy day in a hut or tent as a jar of peanut butter though. Note that fat yields more energy per gram than other foods and that you need more of it when long distance hiking. 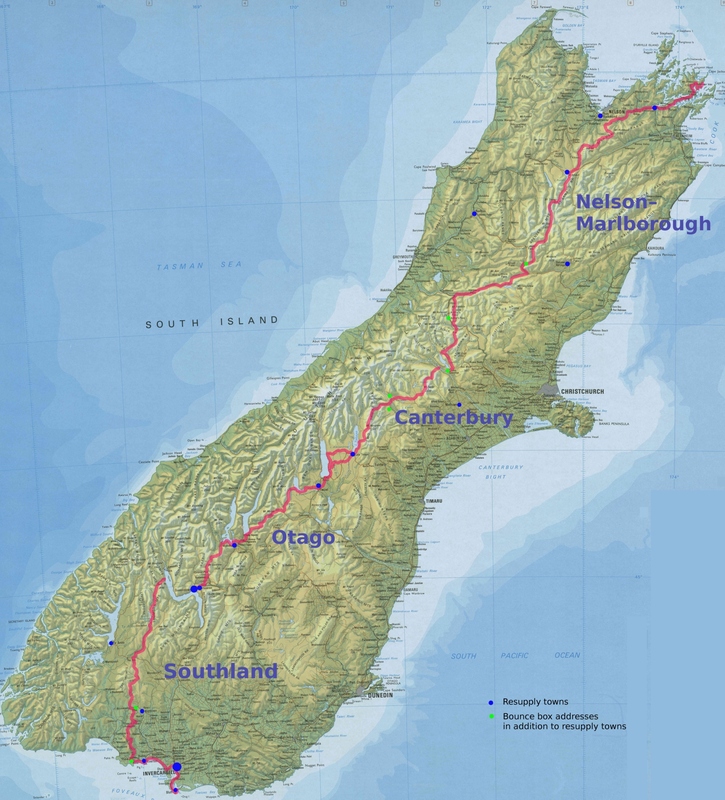 Under the South Island menu you may have viewed the map of the South Island with the route traced out. If you look closely you will see that all the towns where you can buy food have been marked, and other locations where you can send food ahead have also been identified (see the key bottom right of the map). You can click on the map to expand it and then use the ‘+’ cursor to expand further. For some reason you can’t enlarge it as much on mobile phones as computers. Melissa McBride’s site has a good summary of South Island resupply options too. Now, many of the items I’ve mentioned above (excepting chocolate and wraps) can be hard to come by in the grocery stores of small settlements. Don’t expect bulk bins of nuts and dried fruit, for example: you will have to buy expensive pre-packed versions. So that’s where food boxes (aka bounce boxes) come in. You package up the things you think you will need and mail them to your anticipated accommodation. Hostels will generally accept them with no problems, but you should check with other types of accommodation at the time you make a booking, and to confirm their mailing address, which in a few cases is different from their physical address. One or two will charge a fee. Obviously if you send a package to an accommodation you are expected to stay there. And don’t forget to put a date of expected arrival on it, so the people can make a decision on when to throw it away if you don’t turn up. If you don’t know where you are going to be staying then you can send it to ‘Post Restante’ at a post office in the larger towns, but remember to consider whether the post office will be open at the time and day you want to collect it. There have been reports of post offices returning post restante parcels and NZ Post has recommended writing ‘Currently hiking’ on it to ensure staff accept that it may be a while before the parcel is collected. The term bounce box comes from the concept of using the same box and filling it up at a given town, mailing it to the next, and repeating down the trail. So you could keep sending ahead stuff you may or may not need, like a spare pair of shoes, warm clothes, tent repair materials, until you do need them. Or you can estimate when you will need everything and send the lot out in advance. You don’t have to send an actual box of course. The prepaid plastic envelopes sold at NZ Post shops (see picture above) are very strong and a cheaper method. In fact they are so cheap ($7 for the foolscap size or $9.50 for a really large bag, as of 1 July 2018), that the argument that bounce boxes are an expensive option just doesn’t stack up – not when you consider the alternative of buying heavy, low quality food at country stores or going off trail and spending money on accommodation at another town. With the plain plastic bags I would definitely include an inner bag in case the outer one breaks. Or you can put a box or a bubble bag inside of one. Maximum weight is 3kg, which is plenty. You can’t send gas canisters of course. And, after finding that mice or rats had nibbled into one of my bags I would not send peanut butter unless it is factory sealed. Peanut butter is a well known rodent bait because the smell travels. Ditto with cheese. Some accommodation providers are already wary about holding bounce boxes because of the risk of attracting rats and mice. Which leads me to cooking. To save weight on fuel I prefer foods that don’t need actual cooking, just the addition of boiling water. Many that claim they need cooking, like 2 minute noodles or dried peas, are fine with a bit of time in hot water. You can wrap the cooking pot in something insulating after it has boiled to keep the cooking process going longer too. Some people make fitted cosies out of silvered and insulating car sunshades for this purpose. See the Gear page for more on cooking stoves. A few hardy types don’t cook at all. Soaking peas, noodles, etc for several hours in cold water yields pretty much the same result as a quick boil. You can carry a container of soaking dinner for the last hour or so of a day’s hike but I would have thought the weight advantage of not carrying a stove and fuel is then somewhat counterbalanced by carrying rehydrating food. Also, cooking can increase the digestible percentage of a food (especially starch), which is one of the reasons why the discovery of fire gave our ancestors an evolutionary advantage. Lastly, there is the matter of good nutrition. You are going to be putting your body through more than it normally has to deal with, and your food options are going to be severely compromised. I take multivitamins with me, and when I get to a settlement, eat fresh food, including lots of vegetables and protein. Nutritionally sparse belly fillers like instant noodles are best left for the trail. You will also be burning up more energy than usual, so make sure you eat more than you normally would. Most people will lose a good deal of weight on the TA, which can be useful if you are a little heavy, as you will have less body load to carry. But it could be an endurance disadvantage for slimmer people if they lose their usual energy reserves stored in fat. There is some interesting commentary about nutrition on these pages by Laura Lancaster: Food for fuel and Eating for health. The nitty gritty information by Brenda L Braaten from which this is derived is found on Thru-Hiker. Some key take-home messages are that you need relatively more fat in your diet than normal (in a ratio of 50-35-15 of carbohydrate, fat and protein, expressed in % of calories), that men are at risk of burning muscle tissue for energy compared to women, and that you don’t need more salt in your diet despite all the sweating you may be doing, but getting enough vitamin C, iron and calcium can be a concern. Another nutrition site specifically for thru-hikers is Charge the trail, though only some of it is free.